Hair strengthening shampoo for damaged hair and split ends strengthens weakend hair. Extreme hair stregthening shampoo uses our Fortifying Complex to restore and repair hair while protecting hair’s natural shine. Hair strengthening conditioner for all types of damaged hair and split ends prevents hair breakage and tangles. One of Redken’s best selling products, Extreme hair strengthening conditioner protects shine, repairs hair and provides internal strength. Protein hairspray reconstructs, reconditions and adds immediate strength without added weight. Strengthening hairspray will boost your hair’s shine and softness. Leave in treatment for damaged hair, split ends and hair breakage for all types of distressed hair. Its enhanced formula repairs, strengthens and protects hair shine. 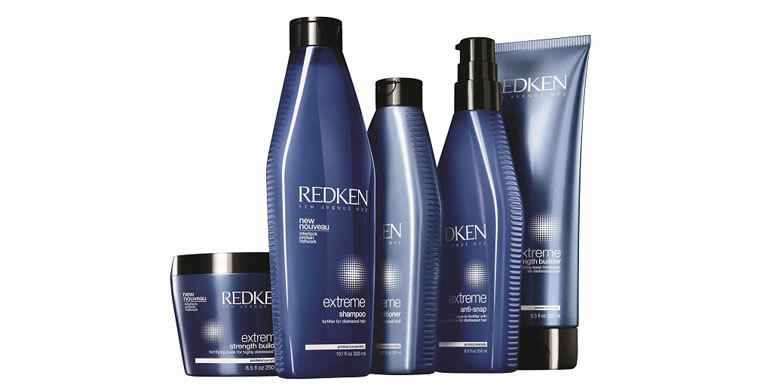 Extreme Anti-Snap distressed hair treatment is an award winning product and one of Redken’s best sellers. Strenghtening hair mask that provides deep conditioning and strengthens hair from the inside out for increased control and manageability. Fortifying hair mask formula specially design to repair, strengthen and protect hair shine. Intense fortifying mask for damaged hair, conditions and strengthens hair to the core. Extreme stregthening hair mask uses Redken’s famous Fortifying Complex with 18-MEA to protect shine, Ceramide for structural repair and Interlock Protein Network for internal strength. Discover all the benefits that this fortifying hair mask can do for your hair. New Extreme Length Primer with biotin builds strength from root to tip and targets split ends. Extreme Length system of Shampoo, Primer and Sealer helps achieve your maximum hair length – up to 6″ in a year. New Extreme Length Sealer with biotin builds strength from root to tip and targets split ends. Extreme Length system of Shampoo, Primer and Sealer helps achieve your maximum hair length – up to 6″ in a year.